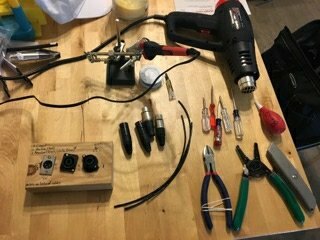 http://amzn.to/2zLCEsDThe other day I was going to All Electronics in Van Nuys California to buy two 2.5mm DC pigtails (I ended up buying a lot more and spending $30 on spare parts and random components for my parts drawers…. that happens a lot.) And I ran into my old production manager Ben Quiles from a show I traveled with 3yrs ago. He now is a audio engineer and was there buying parts for what he called a Z-Cable. It’s a XLR Y-split that also can be a gender changkng barrel. He said he’d send me pics of his build so I could see what he was doing. I asked if I could share the pics for others to learn from and he said sure! 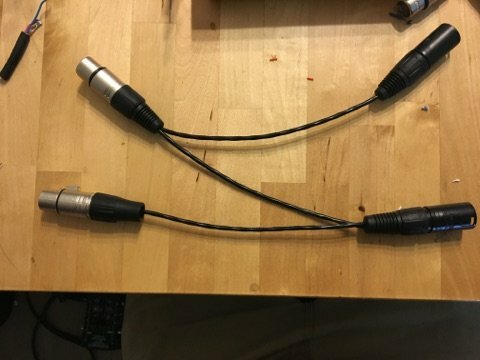 Take apart your XLR connector and slide the back piece and strain relief over your cable. Then strip your wire and tin the each tip with solder. 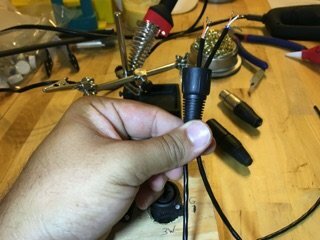 Lock the solder part of your connector into your helping hand. 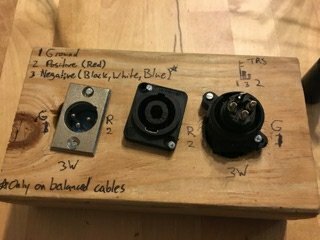 Here my friend Ben has created a custom helping hand for XLR connectors by affixing panel mount connectors onto a wooden block. 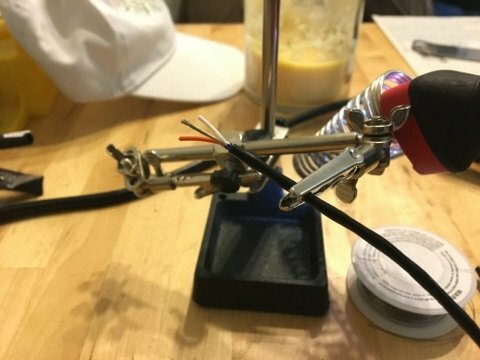 This way he can just click his connectors into place and they won’t move on him as he solders. 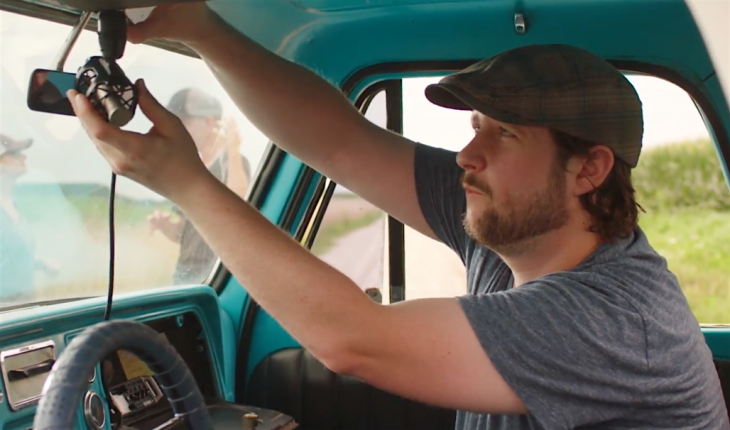 For his work he makes alot of XLR cables and a custom jig for his work bench males sense. 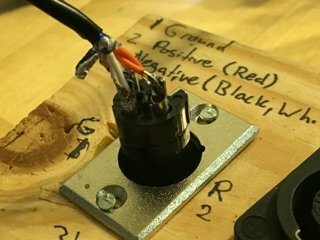 You could also make a jig like this one for any connector type. Since he also buys the same brand of balanced Mic cable he also has written a reminder to himself of the output and color code. Solder the tips to the correct holes. If you cable does not have red and white wires inside assign the colors you want to a pin number. 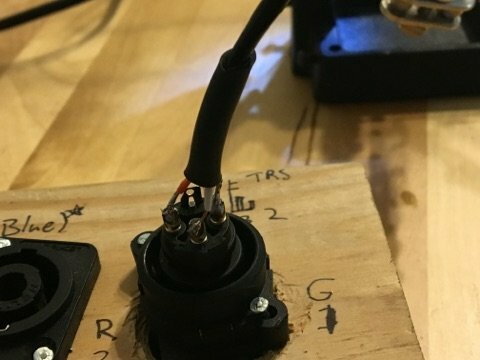 Make sure to write it down so you don’t mess up the pinout on the next 3 XLR connectors. Heat shrink your wire to help give it material for the strain relief to clamp into. Now repeat Steps 1-3 but now with the other end of the first wire and add a second wire. It will look like this. Heatshrink the 2 wires together and solder both reds into the same hole. Repeat for your ground and white wire. Repeat till you’re out of connectors. It helps if every other connector is a different gender. And that’s it. It’s a Y-splitt with am extra split with an the same connector as the first split! This cable can be a barrel and splitter. It doesn’t really take up any more space then a regular y-split but it will definitely see more use! Benjamin Quiles is a local audio engineer in Los Angeles, Ca. specializing in live mixing and systems technology in live events and professional venue houses including the world-known Royce Hall in UCLA and the Alex Theater in Glendale. Many of his credits include working with Oprah, the Los Angeles Ballet, LA Philharmonic, Los Angeles Chamber Orchestra, as well as festivals, conventions and web broadcasts such as Comic Con San Diego, Goldenvoice’s Soulection, and EDC Las Vegas. This fall, he will be touring with the innovative LED-dance showcase, iLuminate. 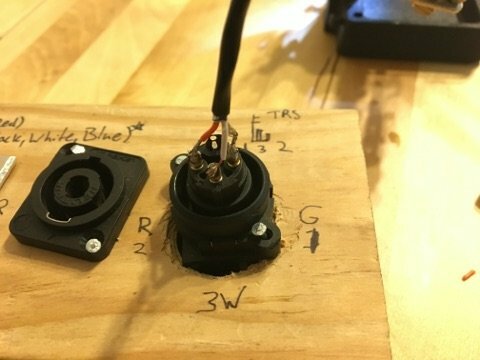 That helping hand jig with matching connectors is genius! What’s up everyone, it’s my first pay a visit at this website, and post is really fruitful in support of me, keep up posting such content.